Join us in demanding that Canada respect the human rights of Palestinians! Click here to tell Senators: don’t trade away Palestinian human rights! 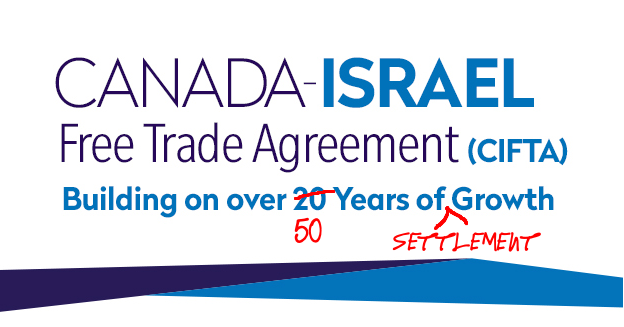 A modernized Canada-Israel Free Trade Agreement (CIFTA) recently passed in the House of Commons. Bill C-85 excludes human rights provisions and allows for products from illegal Israeli settlements in occupied Palestinian territory to receive preferential treatment in Canada. This is completely unacceptable and we need your help to demand that the Senate intervene before the new CIFTA passes into law! On March 27, a letter was sent to all Senators by UN Special Rapporteur on the Situation of Human Rights in the Occupied Palestinian Territory, Michael Lynk, and a coalition of civil society organizations demanding that human rights provisions be added to CIFTA and that settlement products be nixed. Join Michael Lynk, Amnesty International Canada, Canadian Friends Service Committee, Independent Jewish Voices, Mennonite Central Committee, and the United Church of Canada in demanding that Canada abide by international law and respect the human rights of Palestinians! Click here to tell Senators not to trade away Palestinian Human Rights!